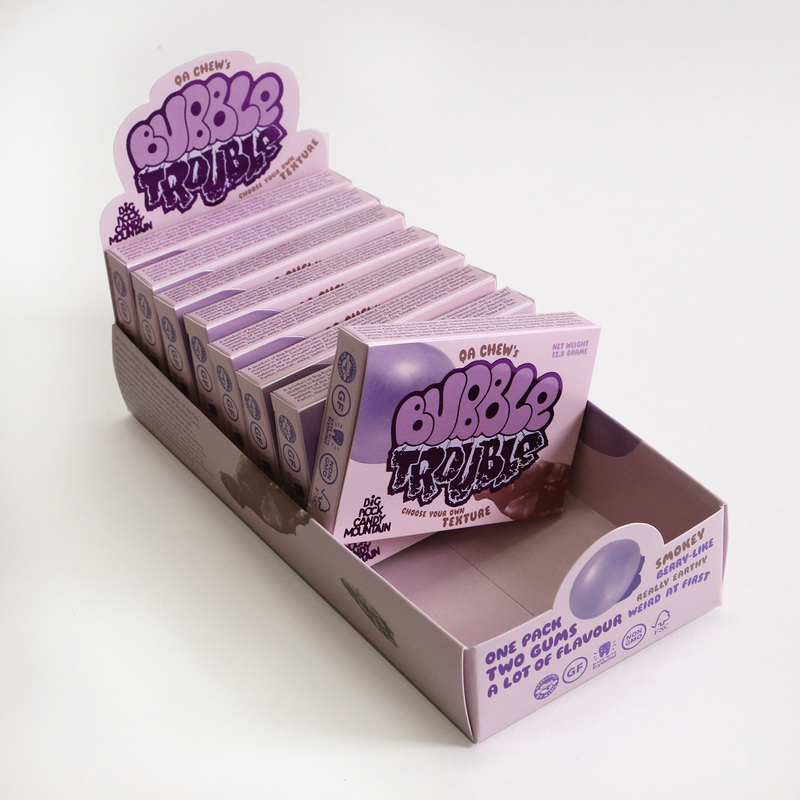 QA CHEW’s BUBBLE TROUBLE is a 2-in-1, limited-run chewing gum. It was developed over the 2017–18 academic year in collaboration with Karen Sandhu’s Grade 6/7 class at Queen Alexandra Elementary School, located in East Vancouver on the unceded territories of the xʷməθkʷəy̓əm (Musqueam), Sḵwx̱wú7mesh (Squamish) and sə̓lílwətaʔɬ (Tsleil-Waututh) nations. The students included Aiden, Alex, Andrew, Angelo, Anna, Anthony, Celest, Edwin, Ellaine, Ellie, Farhin, Hannah, Jacky, Jaden, Jaymes, Jaykwon, Kaleb, Levi, Lily, Saiyaka, Susan, Tatiana, Tessa, and Yoni. QA CHEW’s BUBBLE TROUBLE has received invaluable support from Queen Alexandra Elementary School staff including; Jamine Hickman, Megan Davies, Jon McCormick, Justin Reist, Joe Mergens, and Carole Gomez. We are indebted to independent food consultant and flavour scientist Kathrin Wallace, and to Chip Budde and Tom Hinkemeyer of Organic Gum LLC. Students from Helen Reed and Hannah Jickling’s Community Projects course at the Emily Carr University of Art + Design supported this project in the fall of 2017. They included Heena Chung, Martina Eckert, Ashley Gendron, Klara Kirsch, Esther Lovell, Yan Wan, Kerem Dogura, Maya Gauvin, Taja Jinnah, Marija Kanavin, Michelle Ma, Ning Niu, Michael Peter, and Yang Yu. Terry-Dayne Beasley, Kylie Joe, Cole Pauls, Holly Schmidt, and Cease Wyss brought their expertise to the QA CHEW workshops, research, and documentation, while Chris Lee has support Big Rock Candy Mountain with stellar design work. Vanessa Kwan and Sunshine Frère have contributed their curatorial and managerial expertise via Other Sights for Artists’ Projects. Eric Fredericksen, Karen Henry, Tatiana Mellema, and Tamara Tosoff have overseen this project for the City of Vancouver’s Public Art Program. Additional thanks to Gina Badger, Gloria Bejar, Nadia Berenstein, Diane Borsato, Melissa Cartwright, Jenny Craig, Dina Danish, Margaret Daskis, Maya Gauvin, Paige Gratland, Vanessa Grondin, Brooke Lodge, Madison Mayhew, Piper Nawa, Pablo de Ocampo, Whit Deschner, Jeff Kulak, Ines Min, Martha Rans, Zoe Kreye, Anna White, and Meichen Waxer. QA CHEW is a commission of the City of Vancouver Public Art Program as part of Big Rock Candy Mountain, a multi-phased project initiated by Hannah Jickling and Helen Reed. Big Rock Candy Mountain is a flavour incubator and taste-making think tank produced by Other Sights for Artists’ Projects through the support of the British Columbia Arts Council and the Canada Council for the Arts. QA CHEW’s BUBBLE TROUBLE retails for $2.99. All proceeds will support continued art programming at Queen Alexandra Elementary School. Students want to see the profits go towards good quality art supplies for the school, more artist visits (with “less talking and more hard skills”), and a workshop on how to make memes. Retail locations to be announced soon! The chicle used in this product supports communities that work and live in the forests of the Mayan Biosphere.